and one on the wheel, partially spun up. The goal is to have this all spun up by next Sunday evening -- I don't think watching the Super Bowl will be conducive to spinning a consistent single! The majority of my fibery time in the evenings is still being taken up by spinning (I'm getting about an ounce done every evening, so the end is in sight), so these days the only real knitting time I get on a daily basis is during my lunch break at work. That particular project is a surprise, so I can't show it to you just yet. I will say that it involves cotton and cables, so it's a good thing I'm only working on it 30-40 minutes at a time. 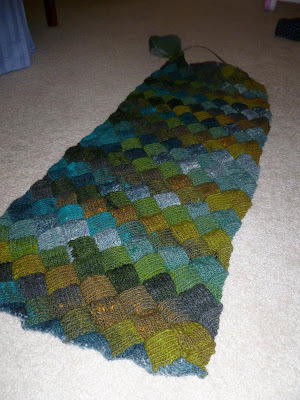 Aside from that, however, any knitting chez Knit/Wit has been on a project that has been resurrected from hibernation. 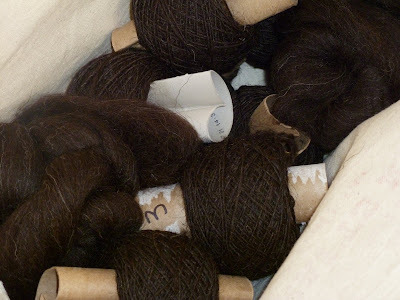 Last week, when thinking about what to take with me to knit night, it suddenly occurred to me that I had a long-dormant WIP stored away in the closet of my fiber room. I had started my Lady Eleanor Stole before Rainbow was born (a check of my Ravelry project page when the topic came up at knit night revealed that I cast on for it on November 3, 2009), and I had worked enough on it to realize that I'd need more yarn than the 10 skeins I already had. Of course I had the bad luck to have picked a colorway that was discontinued, but I was able to find three more skeins of it in an online shop and placed the order. 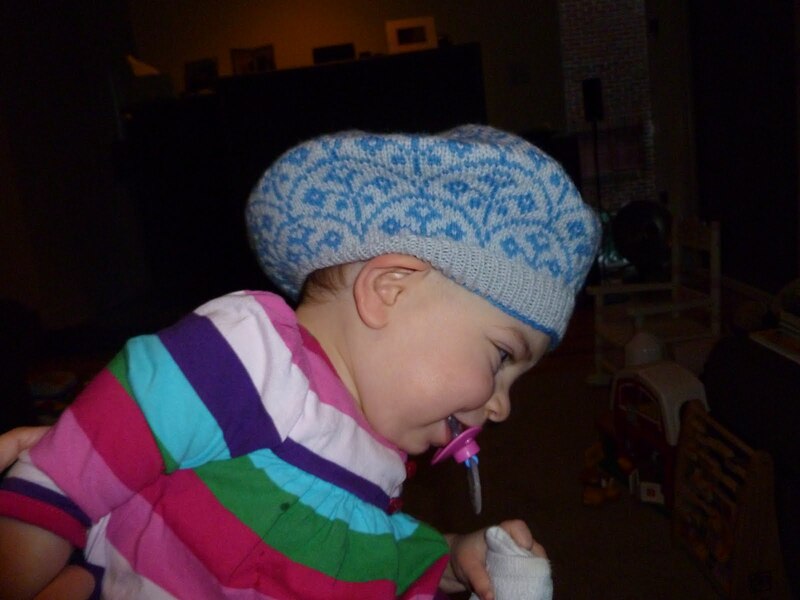 I remember distinctly that those three skeins were waiting for me when we brought Rainbow home from the hospital. I've really forgotten just how addictive entrelac can be. It's one of those knitting techniques that looks really complicated but isn't, and it's definitely a good technique when you need something you can pick up and put down easily. There's no chart to mark or rows to count, and in my case I'm really just knitting until I'm out of yarn, so I don't even have to measure. I definitely need to reteach myself how to knit backwards, though, because it's getting big enough that it's a real pain to flip it back and forth. Although I thought that by now I might've been slowing down in my spinning, I seem to be keeping a pretty good pace. 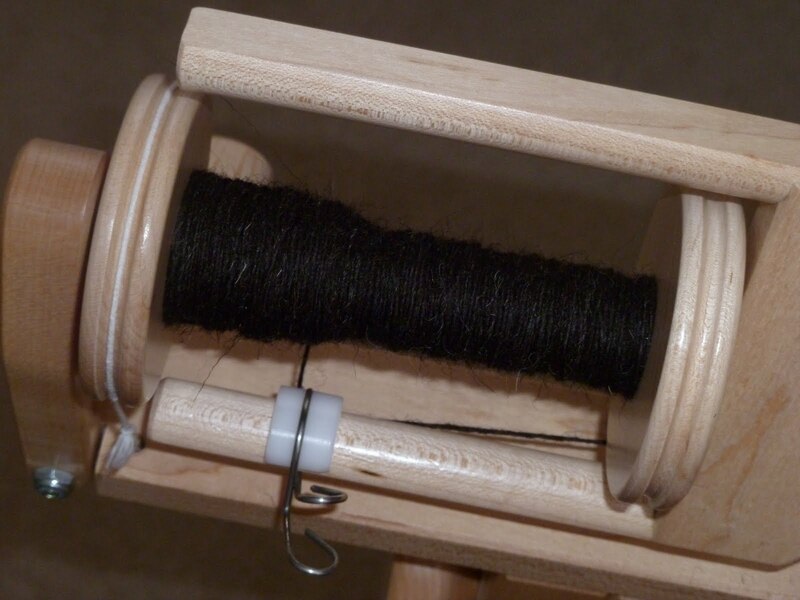 Here you see my status as of this morning -- a total of 17 ounces spun. This afternoon, while Rainbow took a nice long nap, I caught up on some old podcasts and finished spinning ounce number 18. That means I'm keeping a pace of about 6 ounces a week, or a little less than an ounce a day. If I can keep it up, I should have all the singles spun in two more weeks. Plying should take me less time by a significant amount -- I'm hoping I can ply a skein a day -- and then I'll have to pick out my sweater pattern. Dare I say it might be possible to have my sweater done by Maryland Sheep & Wool? 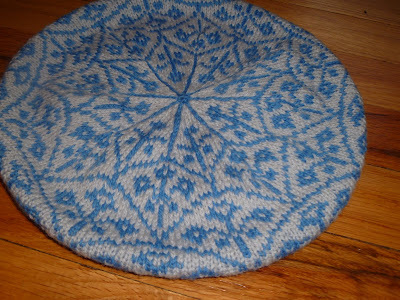 Remember how I promised you a finished knitted project? It took me a couple of days to get a picture (albeit not a great one), but here it is! This was a fun little stash-busting project, using up two more skeins (well, most of them) that were leftover from my colorwork vest. It was my lunchtime knitting, which is why it took so long to finish -- I was only able to knit a handful of rows at a time. It's really quite a fast project; the longest part to knit was probably the ribbing for the brim. The pattern is very well written/charted, and I just love the clever way the decreases at the crown are done in such a way that they're virtually inperceptible. The only change I made was to switch a ssk for a slip/knit/psso, just because I like the symmetry of a ssk with a k2tog. Super cute, right? 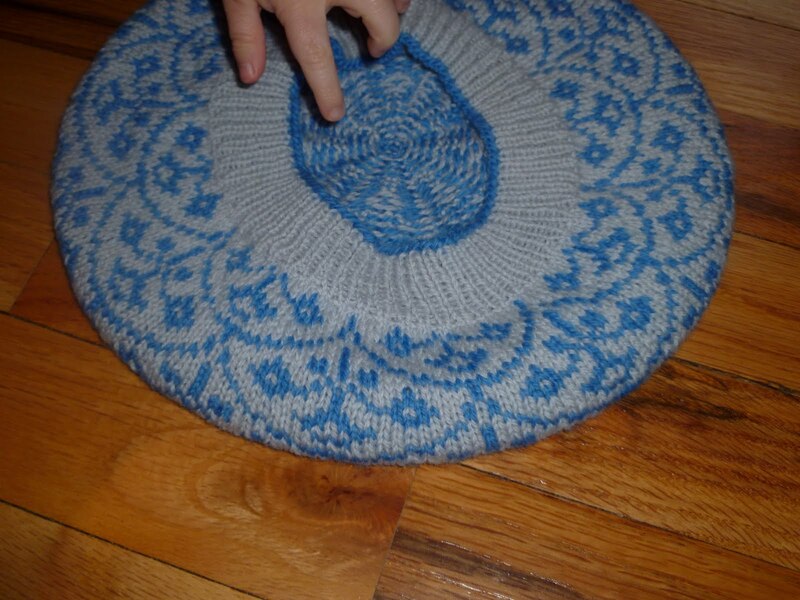 The pattern says to block the hat over a 10-inch plate, but I just laid it flat on one of my drying racks and patted it into the proper width. As you can see, it has a nice level of slouchiness but the ribbing keeps it snug on the head. I know this is a pattern I will knit again! As of yesterday, 12 ounces spun, three more from the first pound to go! Coming soon: a real, live knitted finished object! As of this morning, when I took this picture, I had six ounces spun up and the seventh on the wheel. With all the spinning content in recent post, I'll bet some of you were wondering if I was still knitting. The answer is yes, although lately the knitting has been progressing at the rate of cold molasses. I started a plain sock on Christmas Eve so that I'd have something to work on in the car on the way to D.C. and in the hotel room after Rainbow went to sleep (because even though I'd like to be able to pass out at 7:30 like she does, it usually doesn't happen). No pictures yet -- I only have about half a sock at this point -- but I used some deep stash yarn, the Knit Picks Bare I dyed with Kool Aid many, many moons ago. What I can show you is what I've been working on during my lunch breaks. It's colorwork, so it's also pretty slow going. This is the ribbing and about 20 or so rows of Selbu Modern, a fun little tam that's also serving as a stash-busting project. I'm using a couple of skeins of Knit Picks Palette that were leftover from my Ivy League Vest. 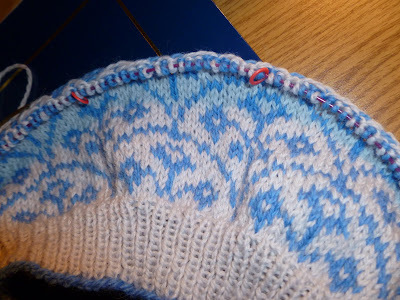 I should have enough left to do another hat with the colors reversed, if I should so choose. After many years of failing to keep my new year's resolutions, I have pretty much quit making them. This year, however, I've decided to embark on a pretty ambitious project for the year. 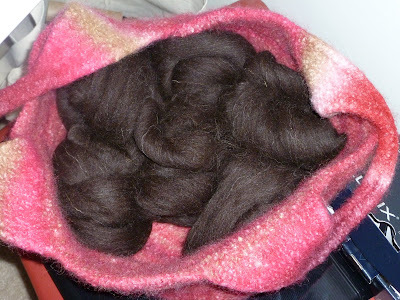 Some time ago, I inherited about two pounds of naturally colored wool from a friend who had learned to spin and then decided it wasn't for her. 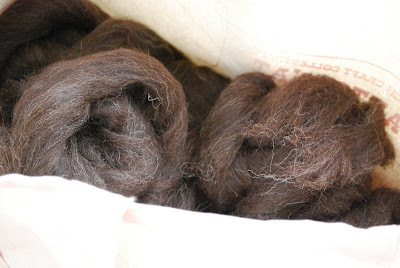 It's been sitting in my stash ever since while I've entertained myself spinning dyed fiber, and late last year I decided that it was time to tackle it. It is a mystery wool -- soft enough that I can bear to spin it but also "tough" enough that it should make a yarn that will wear well. The label calls it "natural black" in color, which really means a deep chocolate brown (in real life, a little darker than it appears in this photo). The goal of this project? 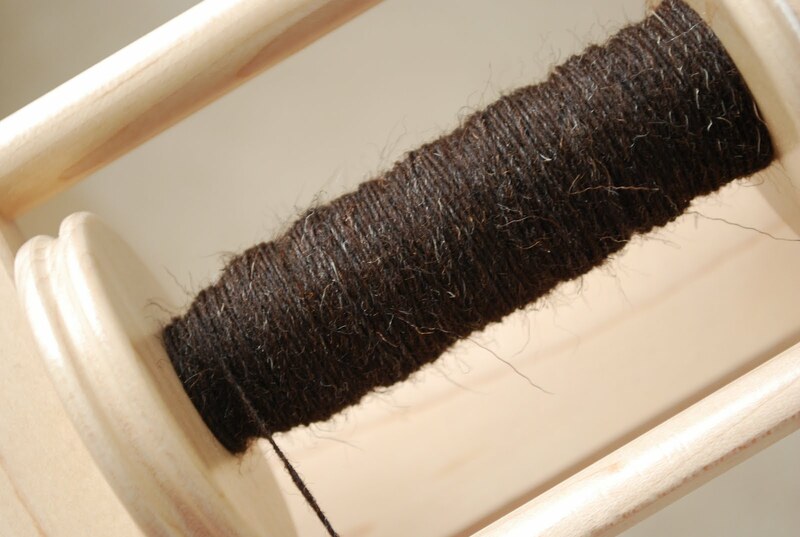 Spin up this fiber into yarn and knit that yarn into a sweater. 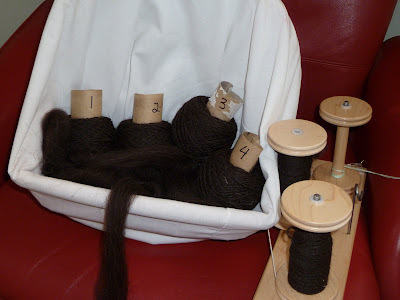 I haven't selected what sweater I will knit yet -- I'm waiting to see how much yarn I can get from the fiber before I pick a pattern -- but I'm trying to spin a three-ply worsted weight yarn. I split up my first pound into little bundles of an ounce each and am spinning one ounce at a time. As of last night, I have finished spinning singles from two ounces and have started in on the third. 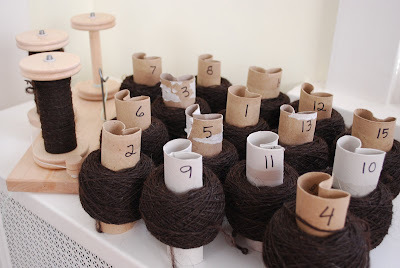 The plan is to spin all the singles (I have a large collection of empty toilet paper rolls waiting to hold the singles so that I have free bobbins for spinning other things) and then ply. I was worried about getting bored with spinning only naturally colored fiber for a long period of time, but so far I'm enjoying it; an ounce is also an easy amount to spin up, so I can take a break between ounces. To clear off my bobbins in order to start spinning my sweater yarn on January 1, I finished up what was on my wheel on December 31 -- Welsh top from Crown Mountain Farms, the September 2010 shipment. 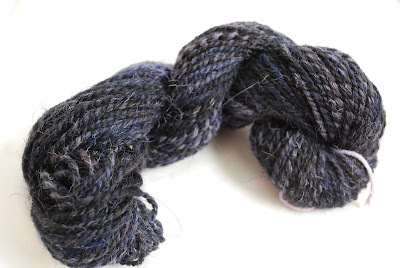 I spun the singles from the fold for a two-ply heavy worsted weight yarn measuring about 115 yards. I don't love the feel of this yarn -- it's definitely way too rough for next to the skin -- nor did I love spinning it, as it shed all over the place, but I did love the colorway (Walpurgis). I finished 2010 having spun up all but two of my CMF shipments; one of those will definitely be spun, one may never be spun. 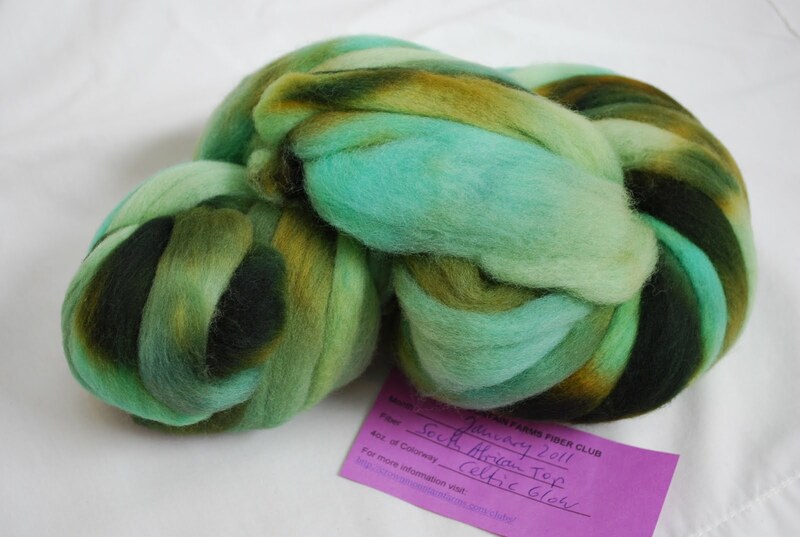 Another fiber going into the definitely will be spun category is the first shipment from the 2011 fiber club, this South African top in a colorway called Celtic Glow. This should be a perfect break from my sweater yarn when I get sick of "natural black"!